MY MOM CAME TO WEST TEXAS!! Last weekend my momma traveled to West Texas from Ohio to visit Joel and I! (Actually, I think she was more excited to see our dogs than us, but I kinda can't blame her (; ) We took her to all of our favorite places around West Texas for a whirlwind long weekend. It was so awesome having her here and showing her all of the places we go. I even made her go to the grocery stores I go to and showed her all of the random places around Midland I may talk about, so next time I talk about them she'll have a visual hahaha. We then headed south to one of our very favorite places in West Texas, Fort Davis. This town is so cute and has so much character! We specifically went to attend a Star Party at the McDonald Observatory, however the weather did not cooperate Saturday night (in fact it thunder stormed, hailed, and was foggy as all get out) On occasions like this though, the observatory has indoor activities that you can attend (or you can opt for a rain check) According to their website the presentations put on during cloudy nights vary, but tend to be enjoyable for all. Obviously we would've rather have seen the thousands of stars in the night sky, but we all did enjoy the presentations put on and learned a lot. The whole drive down to Fort Davis was gloomy and had low visibility, but luckily it cleared up just in time for us to leave Sunday! We got donuts in Alpine near where we stayed the night, (if you are ever in Alpine go to Baker's Dozen Donuts!!!! Everything we ate was amazing and the two ladies working were so friendly!) and then headed back to Fort Davis. 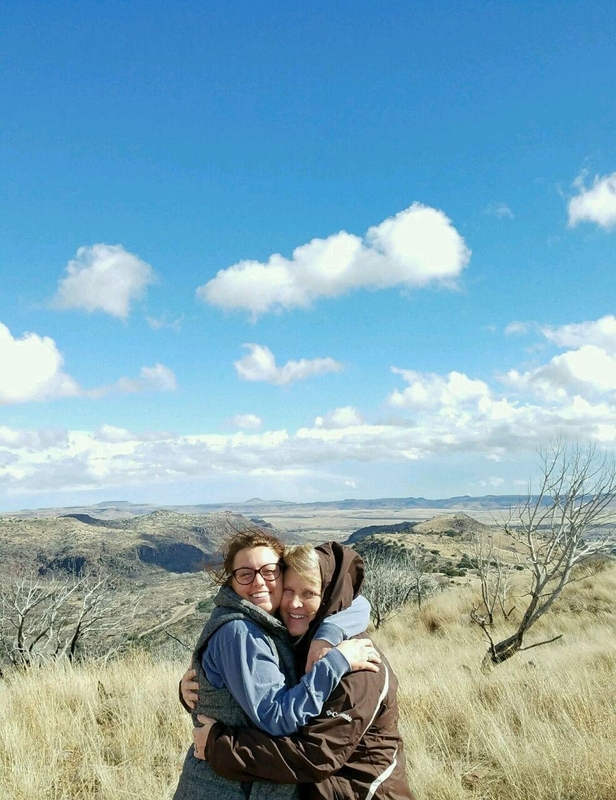 We stopped by Davis Mountains State Park and checked out the Skyline trail/overlook so Mom could check out the amazing West Texas views we always tell her about! We also stopped back at the McDonald Observatory to check it out in the daylight before heading home. These dogs are mildly obsessed with their "Granny"
All in all, even though the weather did not cooperate for us, it was a great weekend! I loved having my mom here with us, seeing her cuddling the dogs, showing her all the places we go to and where we live, and just talking with her and getting to see her beautiful face in person! Thanks mom for visiting West TX! We miss you already! !